The two casts, ‘The Capulets’ and ‘The Montagues’, will perform at different venues; giving each company the time to rehearse with the previously announced Young Casts whilst the tour continues. The Capulet Company consists of Cordelia Braithwaite as ‘Juliet’ and Paris Fitzpatrick as ‘Romeo’ alongside: Reece Causton; Harrison Dowzell (also plays ‘Romeo’); Alexander Fadayiro; Jackson Fisch; Cameron Flynn; Bryony Harrison (also plays ‘Juliet’); Monique Jonas; Daisy May Kemp; Sharol Mackenzie; Hannah Mason; Stephen Murray; Chris Thomas; Roisin Whelan and Dan Wright. The Capulet Company will be performing in: Leicester, Northampton, Salford, London (weeks 1 and 2), Norwich, Canterbury and Nottingham. 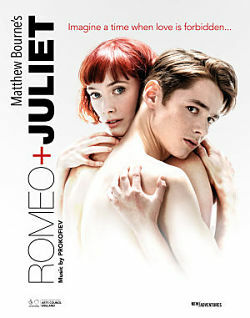 The Montague Company consists of Serena Williams as ‘Juliet’ and Andrew Monaghan as ‘Romeo’ alongside: Jana Baldovino; Madelaine Brennan; Ben Brown; Joao Carolino (also plays ‘Romeo’); Natasha Chu: Gaby Conn; Benjamin Derham; Stanley Duventru-Huret; Louis Fukuhara; Danny Reubens; Asher Rosenheim; Billy Ron Scott; Catrin Thomas and Bryony Wood (also plays ‘Juliet’).The Montague Company will be performing in: Bradford, Plymouth, Cardiff, London (weeks 3 and 4), Birmingham, Southampton and Newcastle. In addition, Kate Lyons, Matt Petty and Mark Samaras will tour with the production and perform with both companies.